"Strength in numbers." "United we stand, divided we fall." Ancient widsom, but more relevant than ever in the Digital Age. Competing effectively through the proliferation of digital influences – from data and analytical insights, to cloud and mobile, changing workforce and consumer demands and globally interconnected supply chains has become increasingly challenging for companies to manage alone. This has prompted a wide-spread global trend towards digital collaboration. 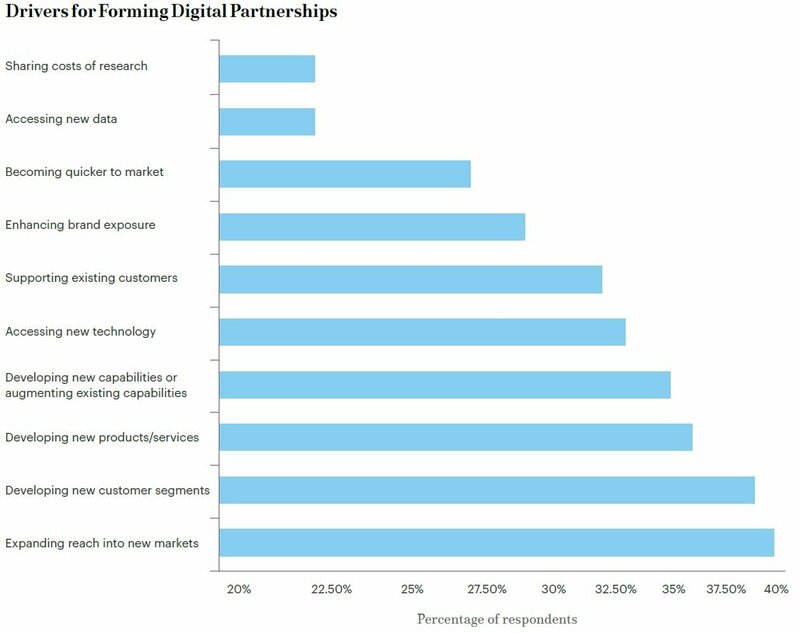 Traditional companies from older industries are fast-tracking their digital capabilities by partnering with digital natives, who in turn are gaining access to the product and service expertise of mature businesses as they attempt to pivot rapid growth into profitable, sustainable business models. These partnerships range from traditional alliances between two or three parties, to distributed networks of dozens or more business, government bodies and other related organisations. An example of the latter is the Amsterdam Smart City - a public-private partnership formed in 2009 by the municipal government, the Amsterdam Economic Board, a telecommunications operator (KPN) and a power-grid operator (Liander). It provides an open innovation between potential partners, with over 100 organisations including large companies, such as Philips, Daikin, Cisco and Arcadis; municipal agencies; research institutes; and startups all actively contribute ideas to the platform and participating in implementation. Other examples include “innovation labs” and “accelerators” where larger established business support startups developing new technology-based products and services, which they hope to leverage to supplement their own knowledge capital. Opening up new markets, and consequent boost to revenue is a key driver for many of these partnerships. Over 60% expect their partnerships to generate at least one-tenth of their income within the next 12 months. For many other businesses, partnerships are a strategic response to the threat of digital disruption, taking positive action while waiting for the actual success agenda to materialise. - Getting the balance right between collaboration and competition. Where's the line between mutual interest and competitive tension? - Establishing enough trust in respective partners - how do you create the appropriate frameworks to protect each party's interests? - Protecting intellectual property - how much unique IP needs to be put on the table? There's many secondary challenges too, ranging from business model alignment, to internal motivation and clear articulation of the business goals. For most organisations though, digital partnerships are a clear avenue for staying competitive. Another path that's increasingly finding favour is to empower knowledge workers with direct access to the tools they need to quickly and cost-effectively address their direct needs, and then build on these to keep solving incrementally more difficult edge case challenges. Check back in next week as we look at SaaS delivered capabilities, and their role in making an immediate and material difference to business operations and outcomes.